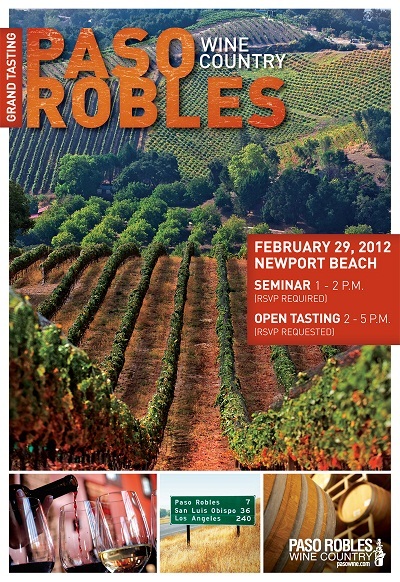 Paso Robles Wine County, one of California’s largest and fastest growing wine regions, is making a stop in Orange County’s Newport Beach to host a series of trade and consumer events as part of their 2012 Grand Tasting Tour. Events take place from February 27-March 2 and include winemaker dinners at marquee restaurants, wine tastings at local retailers, trade tastings and consumer events featuring nationally acclaimed wine producers from one of the nation’s premier wine producing regions, said Christopher Taranto, Marketing Director for Paso Robles Wine Country Alliance. The 2012 Grand Tasting Tour is spreading awareness of Paso Robles Wine Country by bringing the largest tasting of Paso Robles wines from outside of the region to three of the nation’s top cities. First on the tour stop is Newport Beach, making this the 7th annual tour to hit Southern California with Newport Beach as the only chosen stop. The Grand Tasting takes place on February 29 aboard the Yacht “Majestic” which will remain dockside for the entire event and includes exclusive hours for trade and media, allowing Paso Robles wineries to expose wine buyers and influencers in Orange County to their brands. Following trade hours, the event opens to the general public who may purchase tickets to the event. Tickets include unlimited wine tasting, a commemorative wine glass and opportunities to meet with over 40 of the region’s winemakers. Advance purchase is highly recommended as tickets are limited. The complete schedule of events, venue locations, ticket prices, and trade registration will be available online by late January. For inquiries about media passes, please contact Jessica Gago at gago@fastforwardevents.com. 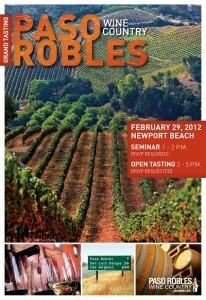 For more information about the Paso Robles Grand Tasting Tour, visit www.pasowine.com. After passing through Newport Beach, the tour continues onto Denver, Colorado, March 26-30 and Washington, D.C., April 9-13. For questions related to the 2012 Grand Tasting Tour, please contact Christopher Taranto, Marketing Director with the Paso Robles Wine Country Alliance at 805-239-8463.
do you have a schedule? I’d like to make an overnite of it if possible.